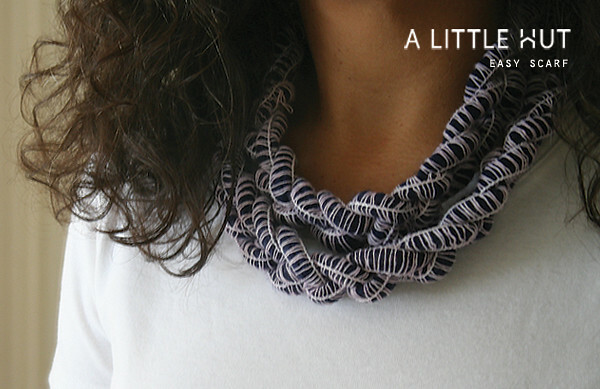 A Little Hut - Patricia Zapata: simple monday: easiest scarf ever! simple monday: easiest scarf ever! Last week I got a boxful of Martha Stewart goodies to work with (you'll see the projects coming up) and one skein of Mambo Purple Caterpillar yarn was part of the package. It's so unique and it was just begging to be used. I love the encasing around the colored yarn! I played with it a bit and I finally decided on making a simple scarf. Yep! All I did was use a crochet chain stitch and no hook. I just used my fingers. If my camcorder weren't out of commission I would've gladly shown you how I did it. For those of you that know how to crochet it's extremely easy to do. The yarn is so thick that handling it is really, really simple. I chained stitched all the yarn a couple of times (crocheted, pulled apart and crocheted again) until I was happy with the looseness of the loops. When I was done I tied the opposite ends together. To wear it I simply twist it in an eight shape, fold it to make two rings and slide it over my head. This project won't take you more than 5-10 minutes. That's it! To celebrate Breast Cancer Awareness Month enjoy this week's freebie SVG awareness ribbon!